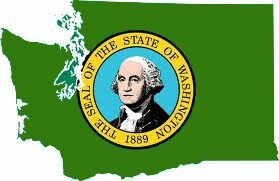 With the elections right around the corner, many people are focusing their attention on the politicians and issues that will play a role in the state's future. A few of them are even taking action. That was the case today, as was seen on the street corner of this small Olympic Peninsula town. 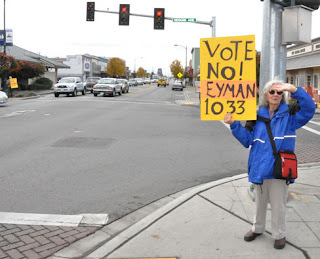 Patty Brown had been organizing a protest for the last few weeks against the latest Tim Eyman initiative on property tax. She had discussed the issue with several of her friends who all agreed something needed to be done to stop it, and maybe a protest might just be the thing. Unfortunately, when the agreed upon day arrived, no one else showed. "It's a little upsetting," Patty said. "I hung a notice up on the bulletin board at the laundromat and put an ad in the classifieds of the newspaper, and still no one. I'm not sure how else to reach the people." Despite the low turn out, and not having attached a stick to her sign, Patty remained optimistic, "If by being here I can persuade just one voter, then I was successful.... even though these things usually pass or fail by thousands of votes." Would you eat this for lunch?